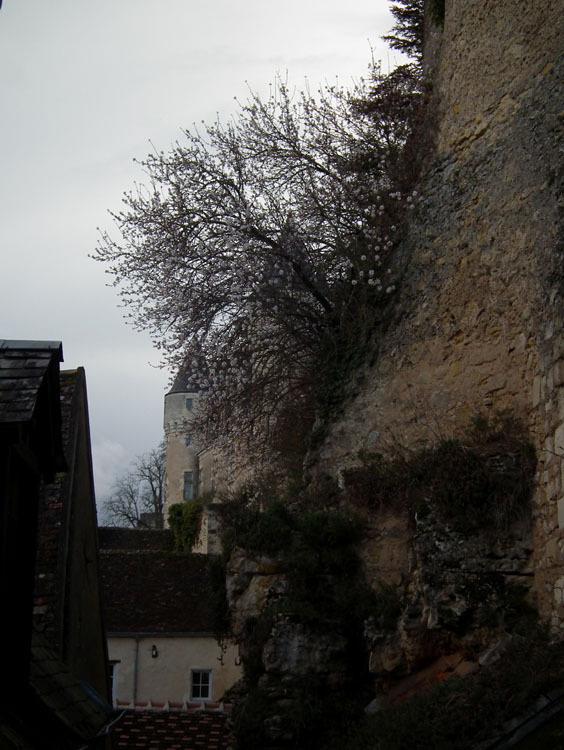 Louis XI looms large in the history of the Touraine. He was the son of Charles VII and in his father's lifetime spent much of his energies on plotting to force his father to abdicate. He's also quite likely responsible for the death of his father's mistress, the lovely Agnès Sorel, whose tomb can be seen in Loches. 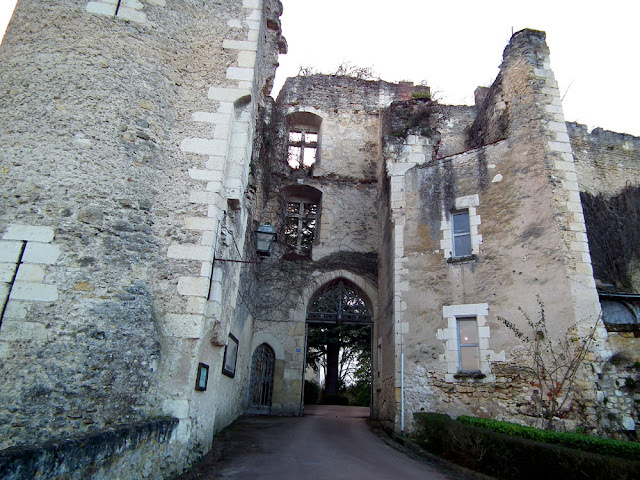 He was present in 1429 when Joan of Arc came to Loches to see Charles VII after the lifting of the seige of Orléans, a major turning point in the Hundred Years War with the English. 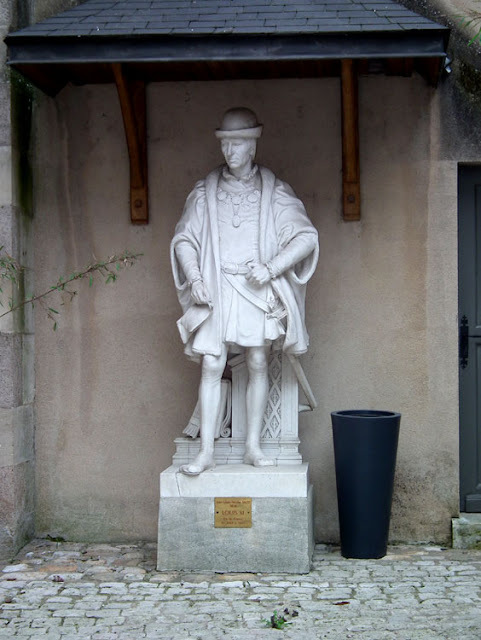 A statue of Louis XI in Amboise, looking like he's waiting to catch a bus. Louis was born in Bourges in 1423, but had to wait until he was 38 to get his backside on the throne. His mother was Marie, the daughter of the formidable Duchess of Anjou, Yolande of Aragon. During his youth he engaged in an uprising against his father and openly disrepected his father's mistress. As a thirteen year old he was married off to the eleven year old Margaret Stewart of Scotland. She died nine years later and when he married the eight year old Charlotte of Savoy against his father's wishes he thought it prudent to flee to his father's longtime enemy, the Duke of Burgundy, to escape the parental wrath. He never saw his father again. 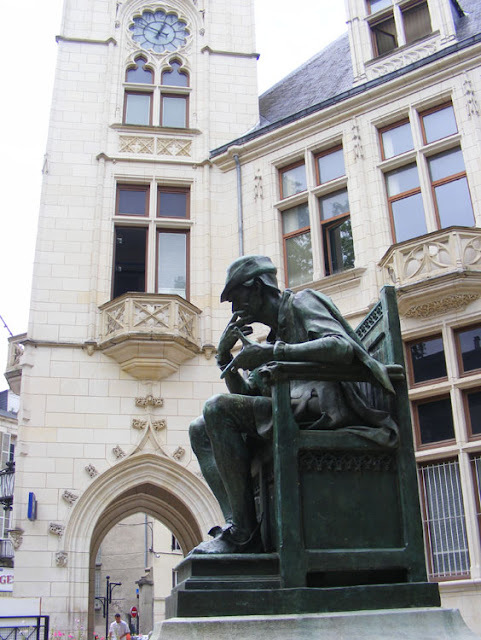 A 19 century bronze statue of Louis XI in Bourges, making him look every inch the Universal Spider. His endless intrigue and diplomatic manoeuvring gained him the nickname of 'the universal spider', the man spinning a web of spies, plots and deals throughout the kingdom and beyond. The nickname came about because of his creation of a network of postal roads and relays crisscrossing the country. Once king he enabled many reforms and freedoms which benefitted the rise of the bourgeoisie, and talent over birthright. As king he was famously miserly and fiscally prudent. When the Duke of Burgundy died, Louis seized much of his territory, including Burgundy itself and Picardie, effectively stealing Mary of Burgundy's inheritance. He meddled in English politics during the Wars of the Roses, aiding his relative Margaret of Anjou, the English queen, to form an alliance of convenience with the Earl of Warwick in order to restore the Lancastrian Henry VI to the English throne and remove the Yorkist Edward IV. The Hundred Years War ended when he paid the English to leave and France entered a period of peace and prosperity. He died in 1483, a recluse in his chateau of Plessis-lez-Tours, leaving his thirteen year old son Charles VIII to inherit a strong, stable kingdom. I was thinking the other day that it feels like ages since we last posted a downpipe photo - and I was right. So to correct that, here's a stylish copper one from Chambord. The other day I got an email from Jean-Pierre Amardeilh, who runs the orchid atlas project for Indre et Loire. 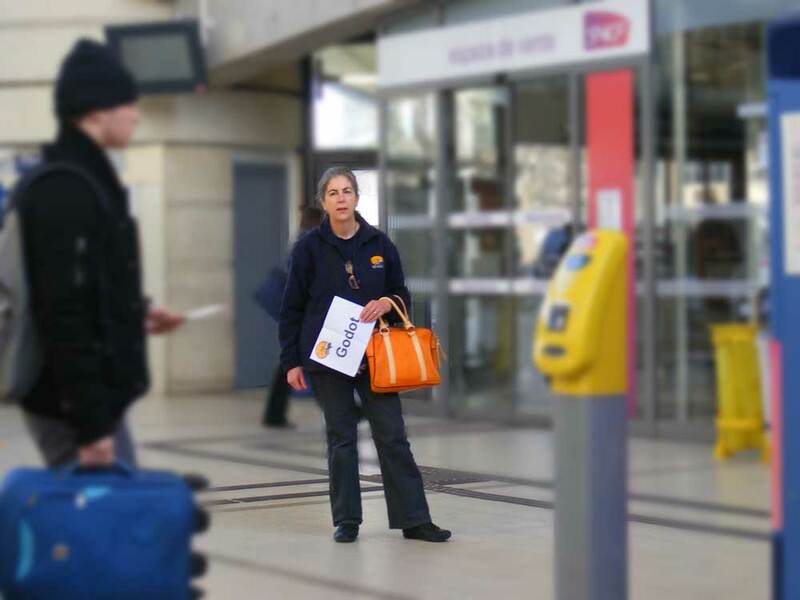 He'd been contacted two years ago by Rolland Paillat, the scientific study officer for the Conservatoire d'espaces naturels de la région Centre, who wanted help with his work to compensate for the damage caused by the new high speed train line between Tours and Bordeaux. 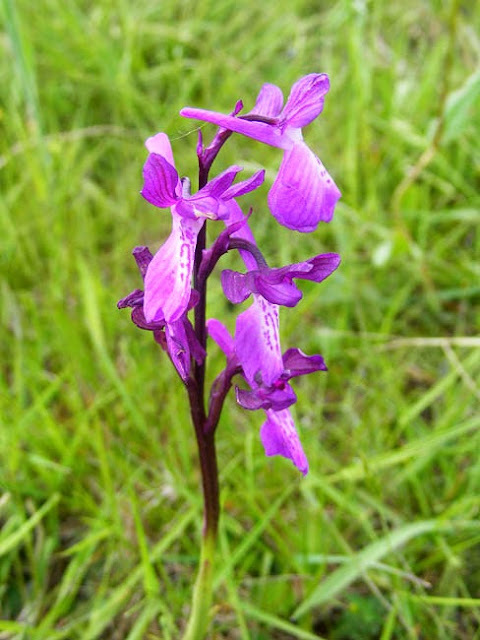 Apparently the line has meant the destruction of a colony of about 50 plants of Loose-flowered Orchid Anacamptis laxiflora (Fr. Orchis à fleurs lâches), a protected species, near Sainte-Maure-de-Touraine. The Conservatoire wanted to find another colony along the trajectory of the train line, no further than 10 km in distance away from the line. The construction company would be obliged to purchase the land on which the orchids grow, and the idea was that for the 50 orchids lost, a new colony of 150 plants must be found and purchased. Rolland was wondering if any such colony exists and figures that if anyone knows it will be Jean-Pierre. He comments that whilst it is true that these big public works fragment habitat, cut through valleys and destroy species, it also means that we get a chance to save other orchid sites which are at risk from modern land drainage, plantations, agriculture, scrub regrowth and so on -- he tries to look on the bright side. Rolland had heard that there was a nice site near Saint-Branchs and Jean-Pierre confirmed this, saying that the Loose-flowereds grow with Western Marsh Orchid Dactylorhiza majalis (Fr. Dactylorhize à larges feuilles) and Snakeshead Fritillary Fritillaria meleagris (Fr. Fritillaire pintade) there and the site deserves to be protected. Rolland indicated that he would be shortly visiting the site to see if it was suitable for his purpose. He duly put his observations on Orchisauvage.fr, but we heard nothing more, so Jean-Pierre decided to email him the other day to find out where the compensatory protection was at. Rolland responded immediately to Jean-Pierre's email. He says that the official purchase process is due to start this year. He liked the site he'd seen, but it is technically too far from the train line. 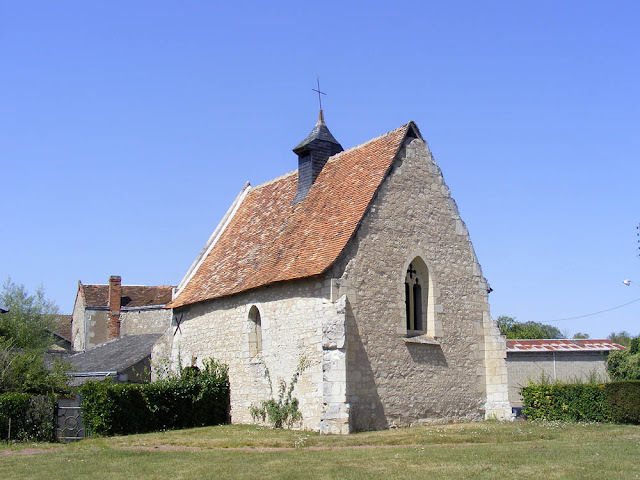 He wondered if anyone knew of other sites in the communes of Bossée, Bournan, la Celle-Saint-Avant, la Chapelle-Blanche-st-Martin, Civray-sur-Esves, Cussay, Descartes, Draché, Ligueuil, Maillé, Marcé-sur-Esves, Neuil, Noûatre, Noyant-de-Touraine, Pouzay, Saché, Saint-Epain, Sainte-Catherine-de-Fierbois, Ste-Maure-de-Touraine, Sepmes, Thilouze, Trognes, Villaines-les-Rochers, Villeperdue and Vou. The other problem with the site Jean-Pierre suggested is that it is in the agricultural area near Saint-Branchs known as the Champeigne, whereas the destroyed site is in the agricultural area around Sainte-Maure-de-Touraine. What he means is that the soil type and land use is different enough on the two sites for it to not be a like for like choice. 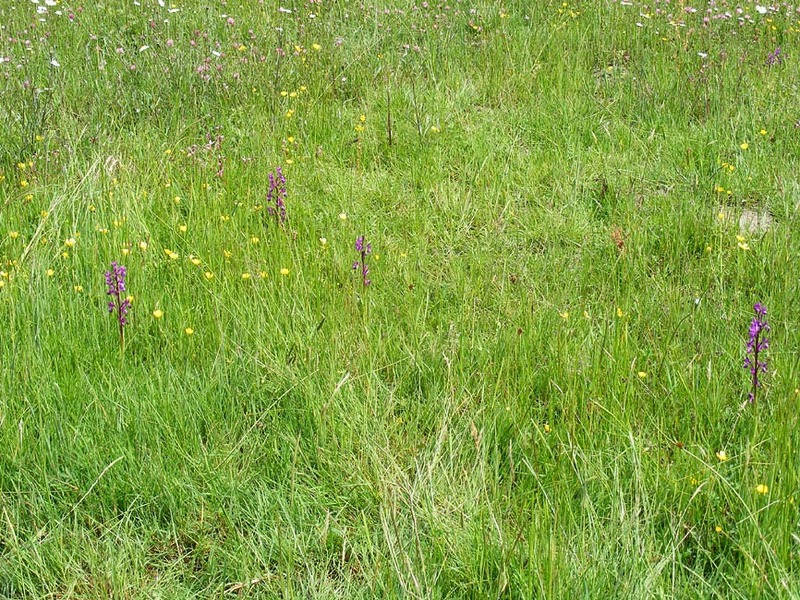 Loose-flowered Orchids growing on Rosnay Common in the Brenne. Jean-Pierre's response was that he didn't know of any colonies of Loose-flowered Orchids in the communes listed, so he has emailed everyone in the Association de botanique et de mycologie de Sainte-Maure-de-Touraine because we are the people most familiar with the flora of the area concerned, and may know of a site which is not yet recorded on the atlas. So far, no luck with coming up with an alternative site, so if you happen to know of a colony that might prove suitable for protection, please let me know. French Orchid Recording: If you are interested in wild orchids please consider contributing to Orchisauvage.fr, the French Orchid Atlas. It is available in French, English, Dutch and German.You don't need to live in France to contribute your records of orchids in France. On Friday 24 March we packed up the car with sleeping bags, pillows, picnic set, folding stools, esky (coolbox) full of food, overnight bags, laptop and GPS. 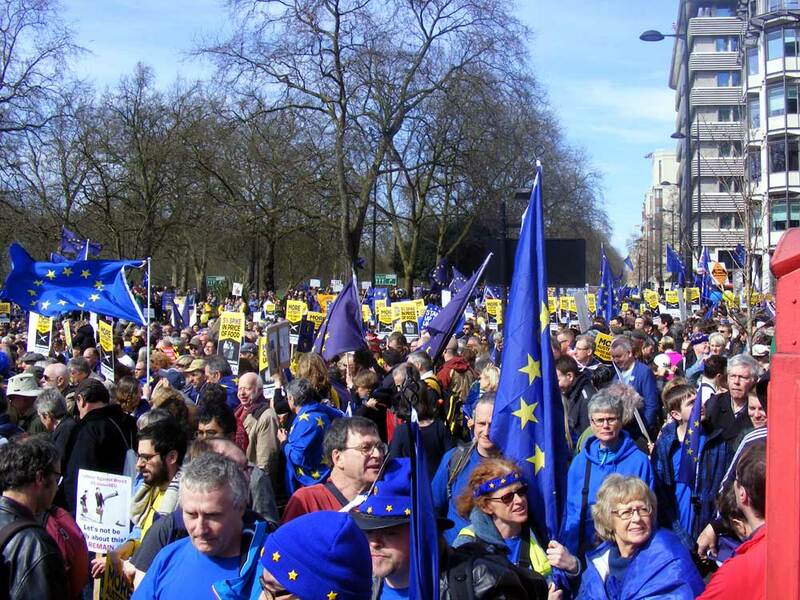 We were headed for London for the march against Brexit that was to be held in Westminster on Saturday. Much of what was in the car (like the sleeping bags) was just precautionary. Taking the national and departmental roads rather than the autoroute we made our way up towards Rouen then on to Calais. Lunch was a picnic by a church in a small village. At Calais we were booked in for the night at the Ibis Budget (along with dozens of members of the border control police force and at least one other couple who were going on the march). We'd arranged to meet this other couple, Marcel and Penny, who live in Brussels and we enjoyed a beer with them before heading for dinner. The next morning at 7am we left the hotel for the channel tunnel. Unfortunately the GPS took us on some weird route that was clearly wrong. This caused stress and panic but we made it to the train boarding port just in time. Simon was travelling on his new Australian passport with a photocopy of his recently expired British passport, which earned him a dry comment about the change in his appearance between the two. Looking down Park Lane towards Piccadilly, just before the start of the march. The tunnel service is excellent and soon we were driving on the left on the M20 motorway through Kent. We were aiming for Swanley train station, which we figured would be a good place to park the car and take the train in to Victoria in central London. I had to pay for the parking using my mobile phone and to my considerable astonishment it worked easily! We bought travel cards for the day just in case we needed to use public transport in London, and arrived in London to have breakfast with Simon's nephew Kippa. Then we met up with Tim and Gaynor (slight miscommunication there about whether it was to be Starbucks or Pret a Manger, and either way, which one, since there are two of both at Victoria, but we found each other without too much trouble). Other marchers were gathering at the front of Victoria station and apparently Pret was handing out free coffee. Damn -- we'd gone over the road to the pub for our breakfast. Everyone moved off towards Hyde Park and then started trying to cross over Park Lane to get to the front of the Hilton Hotel, the designated start of the march. We were directed into the underpass, and luckily it didn't take us too long to emerge the other side, although it was slow enough. Some people must have got trapped inside the tunnel of doom for about an hour. My old friend Emile was by then trying to join us, but he had got trapped on the Hyde Park side of Park Lane, but luckily not in the tunnel. The march attracted thousands more people than the police were expected and they delayed the start for an hour and a half while they sorted out the traffic gridlock that was developing. Emile finally made it as arranged to the red phone box in front of the Hilton and we set off. We were about in the middle of the crowd. One of the best of the placards. Pithy, restrained, self-deprecating, multi-layered wit -- what being British is really all about. It was a beautiful day and people were good humoured and enjoying themselves. Many bounced around photographing their favourite banners and placards. Lots of us got into conversations with fellow marchers as we went along. Occasionally marchers would dive off to buy takeaway food or coffee along the route. Emile and I enjoyed ourselves catching up (it's about 10 years since we've seen one another) and remarking on all the familiar landmarks. The march went down Piccadilly, St James and Whitehall and we used to work in the area. Once at Parliament Square we settled down to listen to the speakers and eat our picnic lunch. Many people had brought flowers and went to deposit them at the front of the square in memory of those killed in the vehicle/knife attack that had occurred just a few days before. I noticed later when we watched video footage of the march that many people had brought daffodils which they were handing out to slightly bemused police as well, as a gesture of respect. It was an extremely well behaved event and I think most of the police enjoyed a nice day out just like we did. By the time we got to Parliament Square the minutes silence for the dead had already happened and we missed at least the first two speakers. I thought David Lammy, the member of parliament for Tottenham came across well, as he always does. So did a nurse who came from Spain 20 years ago and has worked in the National Health Service, married an English woman and considers England his home. Like us, he is worried that Britain's withdrawal from Europe will mean he is no longer able to work or live where he has put down roots. It's probably not a great risk for white professional tax paying long stayers, but the uncertainty and the lack of any credible reassurances is a big reason why people like he and us have got involved in the Remain in Europe campaign. Looking up Park Lane with Hyde Park in the background. The red phone booth in front of the Hilton on the right. We stayed right until the end, then walked back to Victoria station to catch the train back to where the car was parked. We drove from Swanley to Uckfield in East Sussex to stay the night with Simon's cousin Linda, her husband and one of their sons. In the dark, in a left hand drive car, with the GPS wanting to send us the wrong way down a one way street, this proved somewhat more challenging that it needed to be. But by 10.30 pm we were enjoying cheese, biscuits and saucisson together. We didn't get to bed until 2 am and had to leave by 10 am to catch our channel tunnel train but it was lovely to see them. In the end we were early to the channel tunnel port and got an earlier train. This was great for us because it meant that by driving down to Preuilly on the autoroutes, we got home just before dark after a door to door journey of 10 hours (with a power nap at Alençon). We are very glad we went on the march. The police estimate the marchers numbers at 120 000. We don't suppose Brexit will have been stopped by the demonstration, but we feel it was important to personally be there. I was quite struck by how much it felt like individuals counted, just by being there. The bloody minded pursuit of Brexit by the British government following a referendum that in other circumstances would have been too close to call remains a shocking and unjustifiable misuse of power as far as we are concerned. We cannot understand what the government thinks it will gain by withdrawing from Europe, and unfortunately we can see all to clearly what they will lose. We are Europeans by accident and good fortune, and we believe very strongly in a united Europe. It seems unlikely to us that isolating your country is a sensible way of governing or doing the best for your citizens. Some good will come of it though -- many more people are engaged by politics and willing to make their voice heard, rather than blindly ceding power to an unscrupulous cabal whose motives are extremely suspect. Unfortunately, I think the fight will need to continue for years, and us woolly liberals will need to toughen up. 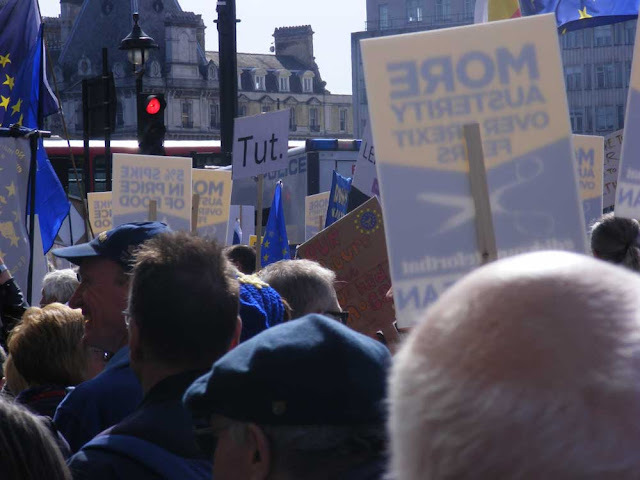 Simon's album of photos from the march can be viewed on his Facebook page. We drove to Calais (via the D roads) on Friday, then on to London on Saturday morning. 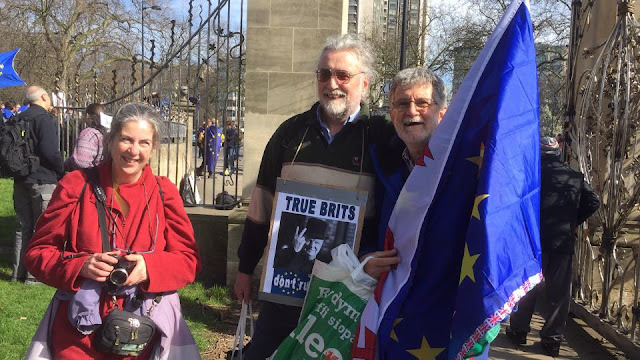 We met up with Kippa (my nephew) for breakfast, then Gaynor and TimB for the anti-brexit march (and Emile, after he took an hour crossing Park Lane due to the size of the crowds). After the speeches (we stayed to the end) Susan and I drove to my cousin Linda's place for an evening of cheese, cheese, cheese, and laughs, then drove home yesterday. We covered 1526km, which should have been slightly less but the mad women in a box kept on trying to make us drive the wrong way up a one way street. And she doesn't cope with motorway junctions. And sometimes she seems to confuse left and right. In the end what we did may not make a difference, but you do have to make sure your voice is heard amongst all the lies. This immature (< 4 years old) Pacific Gull Larus pacificus cruises past my position on a New South Wales coastal headland. 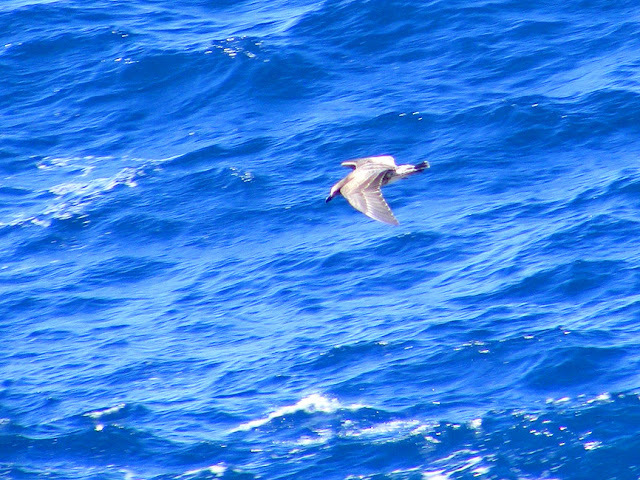 The water is a beautiful blue but I don't suppose the scavenging gull cares. The species is fairly common, and much larger than the better known Silver Gulls. This behaviour of patrolling the seashore alone is typical. 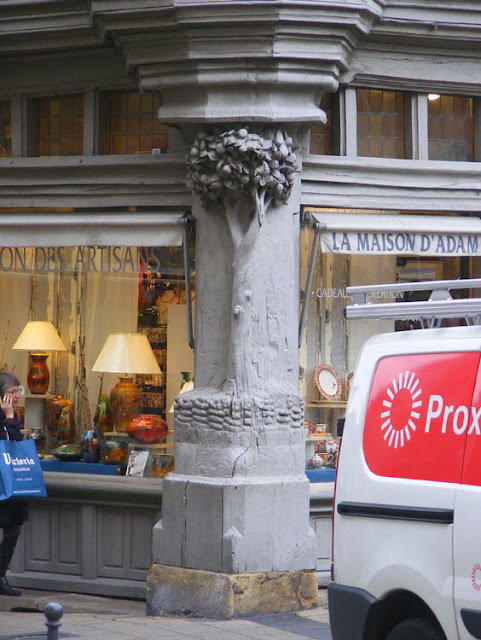 The Aged Care Facility (EHPAD Maison de retraite) runs the meals on wheels service for the elderly in Preuilly and surrounding villages. 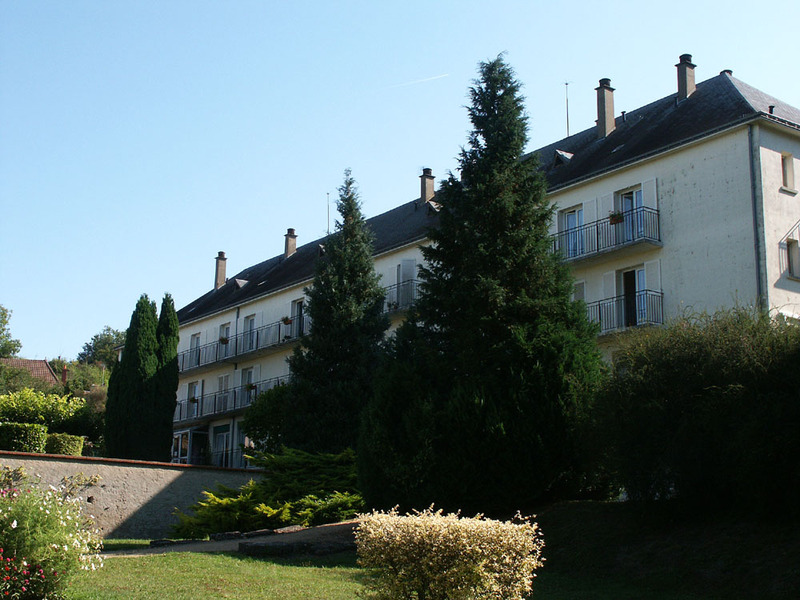 Residential wing of the Maison de retraite, Preuilly-sur-Claise. Three times a week a panel van driven by Flora does a circuit around the district, delivering a full meal of soup, starter, main course of meat and vegetables, cheese and dessert to elderly people. Flora drives 120 kilometres each time and delivers 33 meals. The meals are made by the cooks at the Aged Care Facility in collaboration with the dietician. Special diets are catered for and replacement dishes can be provided if the service is asked for them in advance. The meals are delivered cold and reheated in the home. 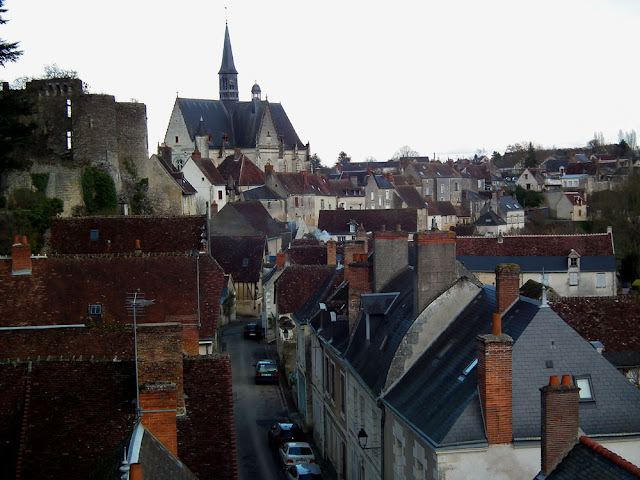 Monthly bills are sent by the Treasury in Ligueil and the meals cost €8.90 each (subsidies can sometimes be obtained from the Aged Persons Association). New wing of the Maison de retraite under construction in 2008. The service covers the communities of Preuilly, Bossay-sur-Claise, Boussay, Chambon, Chaumussay, Charnizay, Petit-Pressigny, Saint-Flovier, Tournon-Saint-Pierre and Yzeures-sur-Creuse. At the last meeting of our town council the budget for the restoration of the Chapelle de Tous-les-Saints was discussed. 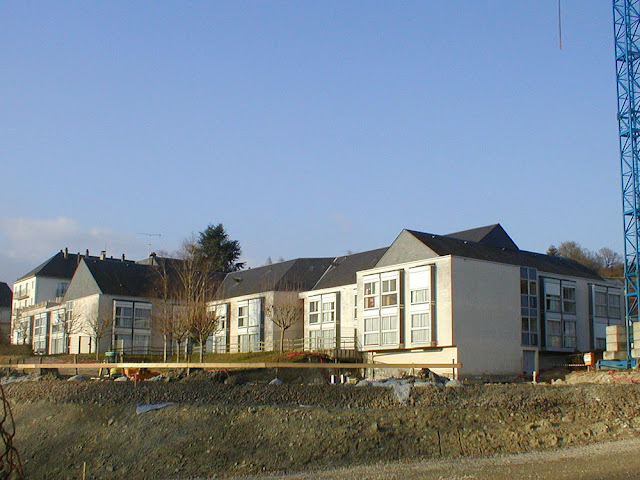 Quotes from tradesmen are in and the work will start this year with a spend of €169 829. That will allow the building to be made watertight and the wall paintings to be protected. 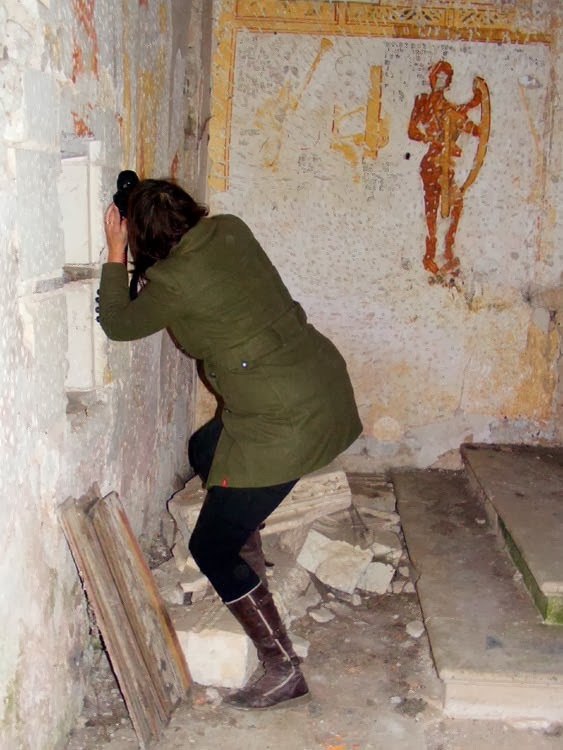 Sabine de Freitas, the wall paintings conservator, checking the condition of the chapel's danse macabre. which is a total of €125 990. The current state of the carpentry. The town council has already agreed a grant of €11 840 and will advance €22 519 (which they will get back when the sales tax is reimbursed). The council agreed and passed this budget with 13 votes of assent and one abstention (Guy Buret). La Maison d'Adam is one of the unmissable sights in Angers. It is one of the outstanding architectural testiments to a medieval heritage which are scattered about the city today. The 'House of Adam' (also known as 'the House of Adam and Eve' or 'the House of the Tree of Life') was constructed towards the end of the 15th century. It was acquired in 1900 by the local artisans association and is sometimes referred to now as the Maison des Artisans. 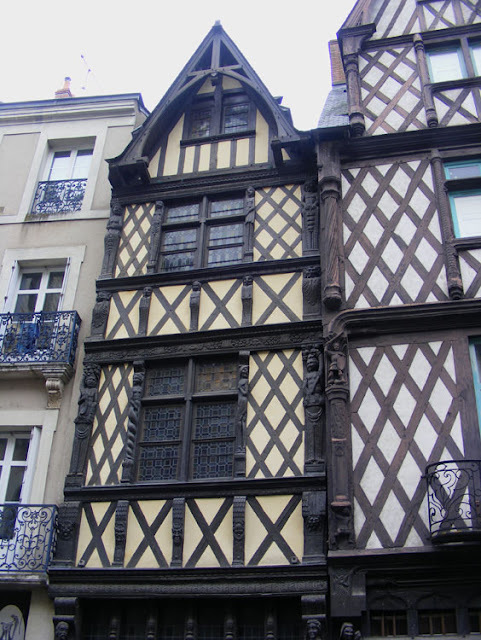 Situated in the Place Sainte Croix, by the apse of the cathedral and on the crossing of the two major commercial streets in the city, the 'House of Adam' is the most exceptional of around 40 extant timber framed buildings in Angers. Its dimensions are imposing, its structure complex and its decoration enigmatic. 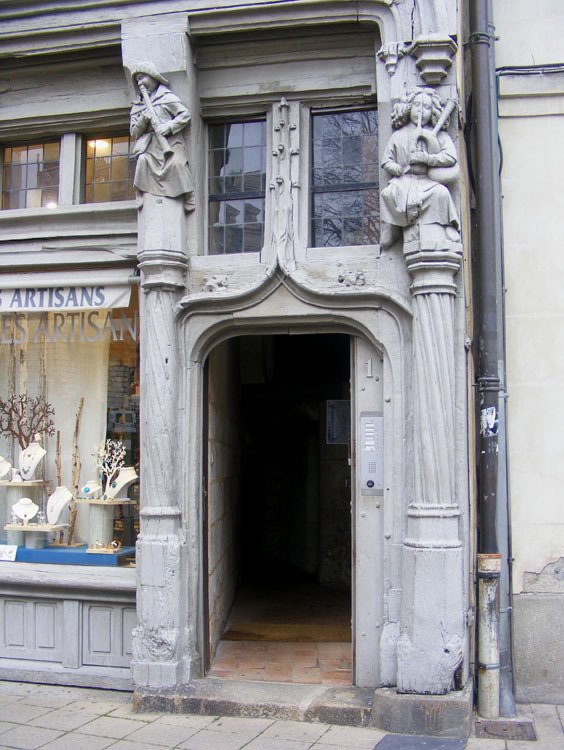 It is truly one of the most remarkable works of carpentry from the French Middle Ages. 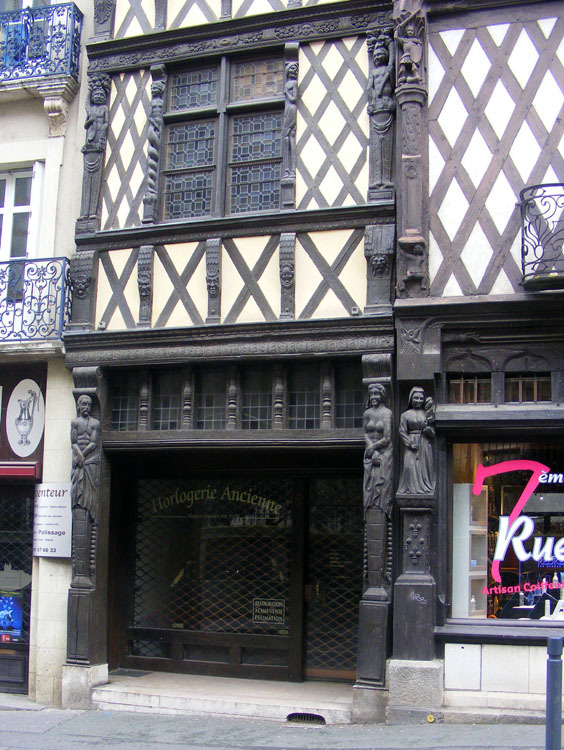 It owes its name to the statues of Adam and Eve which once stood either side of the Tree of Life on the ground level corner of the building, and it seems to have been known as la Maison d'Adam since at least the 17th century. Recent dating evidence puts its construction at 1491, and the original builders and subsequent owners were apothecaries. 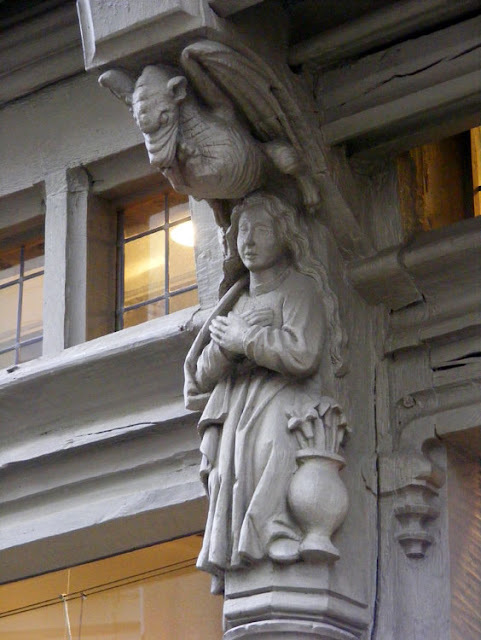 Mary menaced by a dragon. Today set back from the square, originally it sat right on a major crossroads, flanked by tall thin merchants houses. Its ideal location permitted the double fronted facade that was twice the normal length in both directions, and six storeys high instead of the normal four storeys. The multiple gables, the decorative lozenge shaped fills, the deeply moulded horizontal string courses and corbels supported by thick carved posts illustrate in magnificent fashion the skill of the carpenters at the height of their powers. 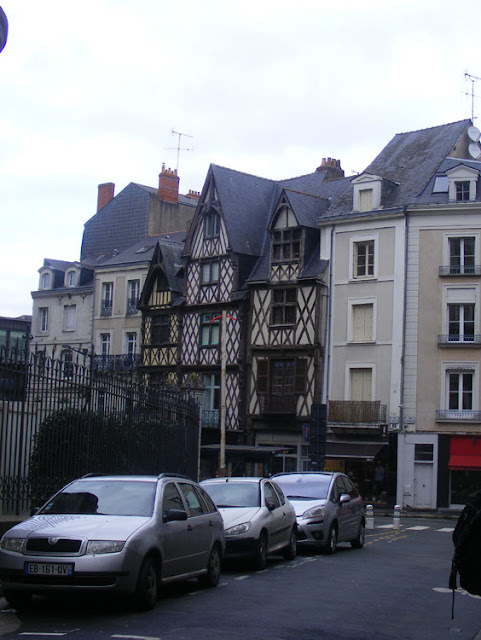 The corner tower houses tiny offices known as écritoires or comptoirs. It is the richness of the sculpture that above all marks this building out. The decorative themes range from the naturalistic, like the knots in a tree, to the stylised twisted flutes on the posts. 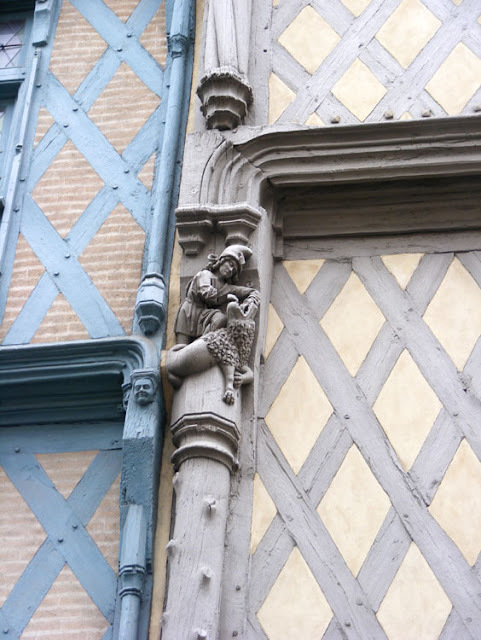 There are numerous carved scenes and each post has a character figure or an animal. The themes are either religious or mythical on the one hand or vulgar and profane on the other. The shawm player (left) and the bagpipes player (right). The religious subjects include the Virgin Mary and the Angel of the Annunciation, the Pelican (symbol of the Resurrection) and Saint Michael or Saint George slaying the dragon. 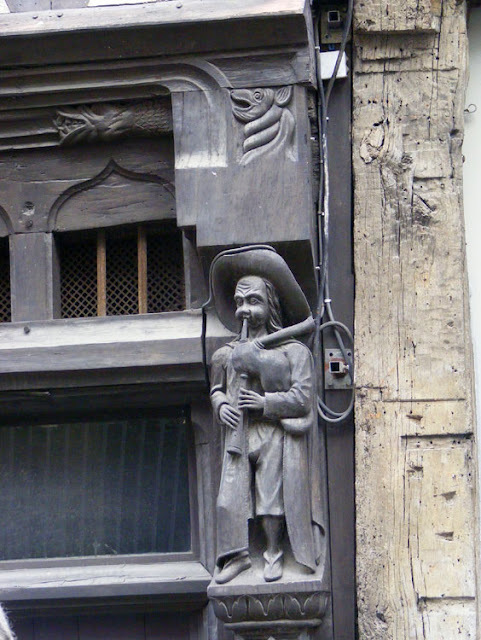 Then you have the lovers, the flute players and a selection of fantastical creatures. All of this was once painted in bright lifelike colours, but any remaining original paintwork disappeared with a major remodelling in 1814. The other day we were driving through the Forest of Amboise, between Chenonceau and Amboise, and a large black and tan hound came lolloping down the road towards us. He was on his own and as cars spotted him they slowed down. He came right up to the car going in the opposite direction to us, and then right up to us. He seemed to be checking the occupants and hoping to see someone he knew. We drove slowly and reluctantly past him (we couldn't have fitted him in the car even if we'd wanted to pick him up). A bit further down the road we came across a group of chaps with cameras and binoculars. 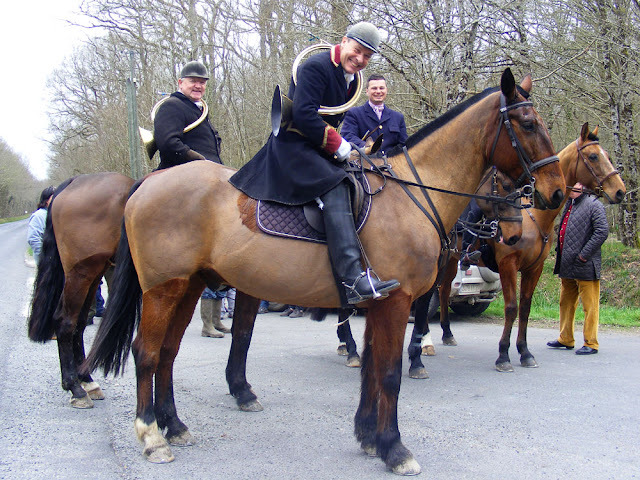 We drove past them, thinking they were birdwatchers on an outing, but soon we encountered a group of mounted hunters. That was who we were looking for, as we realised they must own the dog (and in fact, the chaps with cameras must have been hunt followers). We pulled up and I jumped out to tell them about the dog. They thanked me and said they would send someone to fetch the errant beast, who had obviously got separated from the rest of the pack. Then I asked them if I could take a photo and they agreed. The jocularity I captured was because there was some banter about whether I wanted to photograph the young and handsome members of the group or the old experienced hands. The horses have all been clipped because they get too hot otherwise in their fuzzy winter coats. Riders generally like to clip horses if they are going to be working because if they get sweaty it takes them a long time to dry off so they can end up first too hot and then cold and wet. Also at this time of year they will pick up quite a lot of mud and if their hair is long it will get matted and be more work to groom. 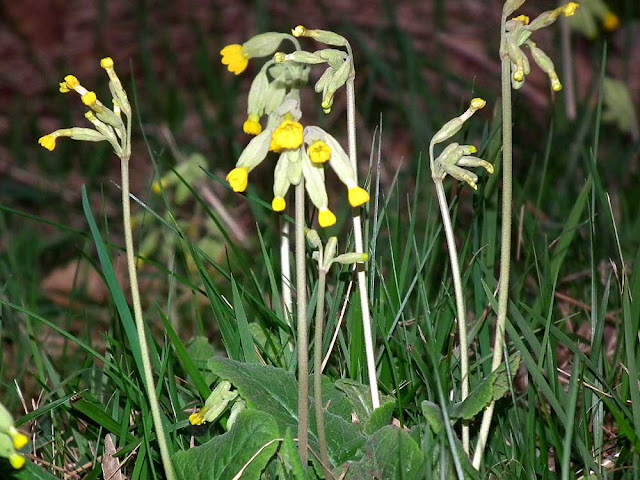 It is a tradition of ours to post a photo of a coucou (cowslip) every year as soon as possible after they flower. Last week I commented to Susan that the coucou were late (6 weeks or so later than last year), and then almost immediately we saw our first. They are not as numerous as they have been in past years, either - many councils have mown the roadside verges already. Here are some that have just about survived the carnage. Brexit March: We will be in London for the march against Brexit on the weekend. 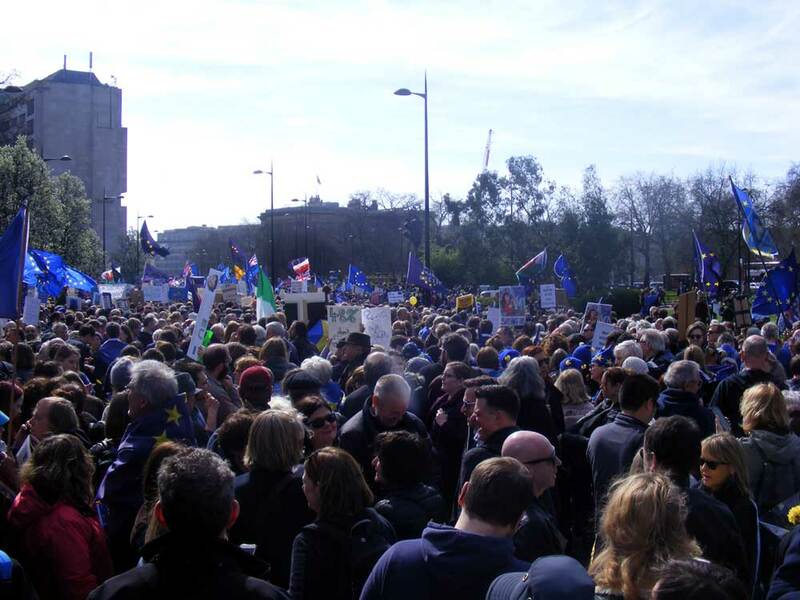 We are planning to meet friends and family at Victoria station, then the group calling themselves RIFT (Remain in France Together) in front of Buckingham Palace, before moving on to the start of the march at the Hilton Hotel. I'm hoping to catch up with my friend and former colleague Emile there too (he has the 'reverse' issue to us, being an EU national living and working in Britain). If you are planning to be there too, get in touch and maybe we can co-ordinate something. As tour guides it is important we know as much about the area as we can. This includes knowing which public lavatories one can trust, and which to avoid like the plague (or in case you catch the plague, which sometimes seems a credible risk). 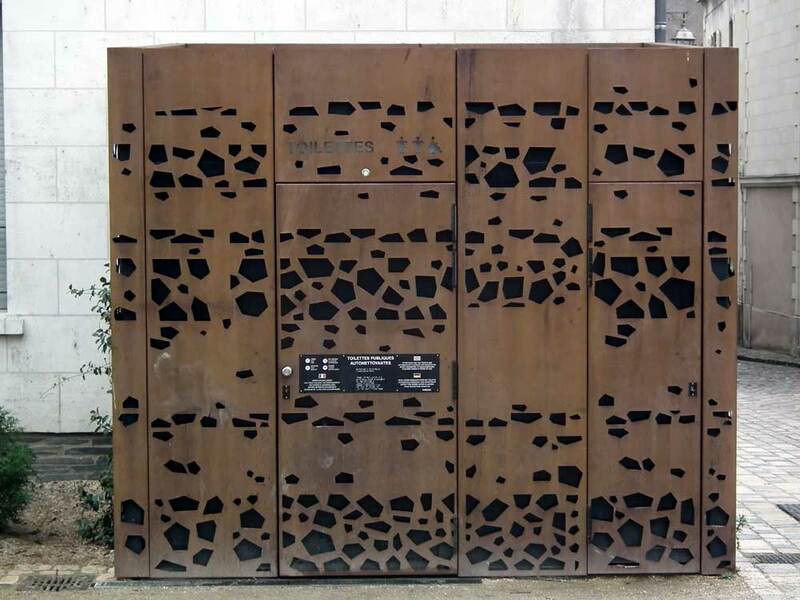 There is no such risk at this well disguised automatic "cabine" in Angers. Recognising it as a WC might be a challenge, but we were really interested by the effort made to stop it jarring with its surrounds. 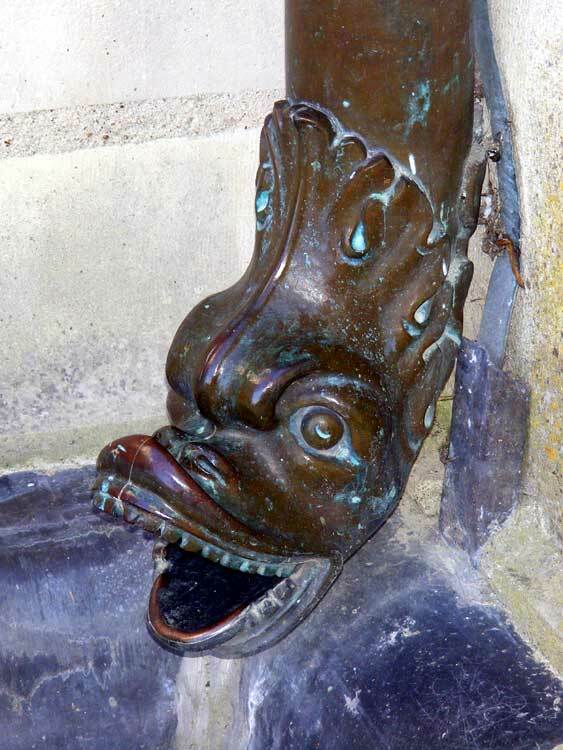 This isn't the first great public loo we have featured - others are here and here. Wonga Pigeons are reasonably common in much of eastern Australia, living in rain forest and coastal forest. 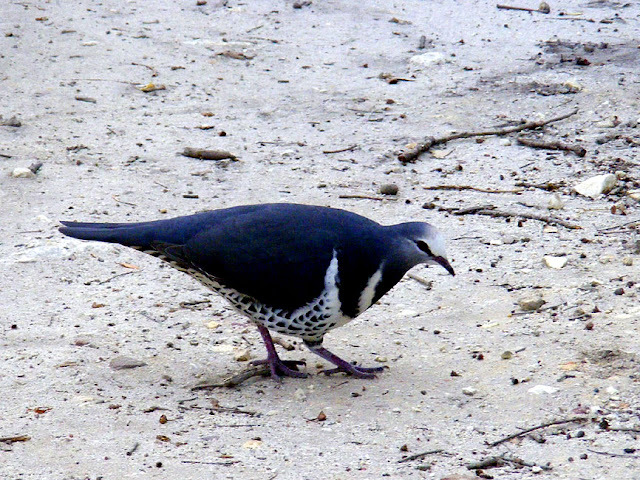 They will emerge to feed on fruit and seeds the ground on walking tracks and picnic areas, but otherwise they are quite difficult to spot. You are more likely to hear them in the forest, making their distinctive woop-woop-woop-woop-woop call or clapping their wings together as they take off in a panic. 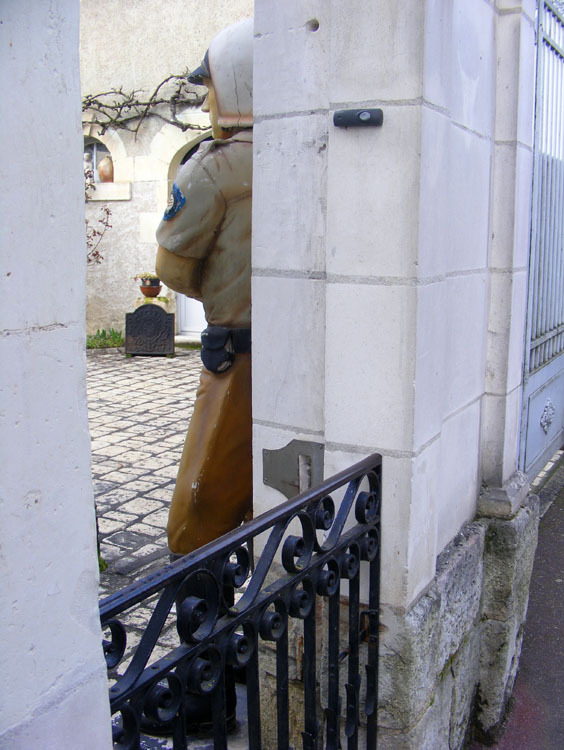 I walk past this gateway almost every day and every time this life size model of a US highway patrol man catches me out. I glimpse a person just inside the gate and prepare for a brief conversation as one does when passing in a small country town. I haven't said bonjour to the policeman yet, but I bet some passerby has. The house belongs to a local brocanteur (second-hand) and antiques dealer and the policeman is a recent addition to the collection. I've no idea how much they want for it, but presumably it's cheap as CHiPs. Once again I know nothing specific about these three timber framed (Fr. pans de bois) buildings in Angers. 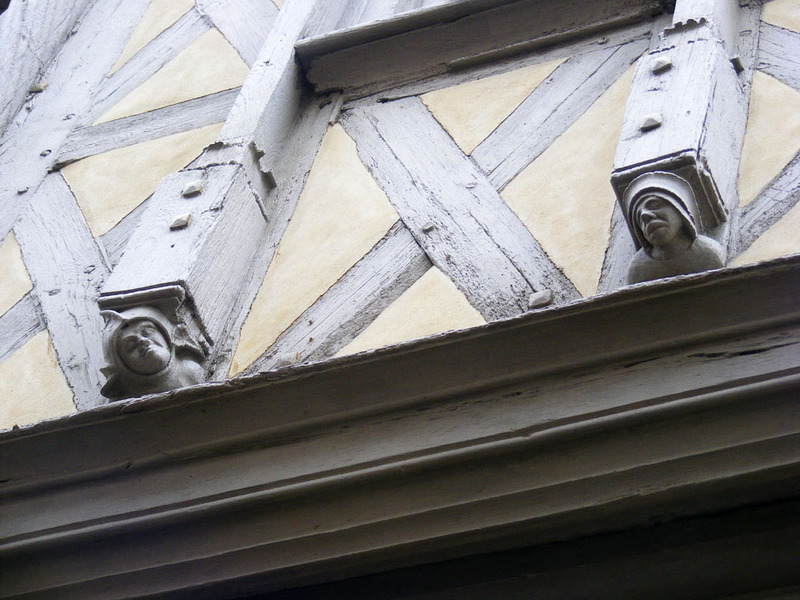 They are 16th century because the upper floors are not jettied out over the street. 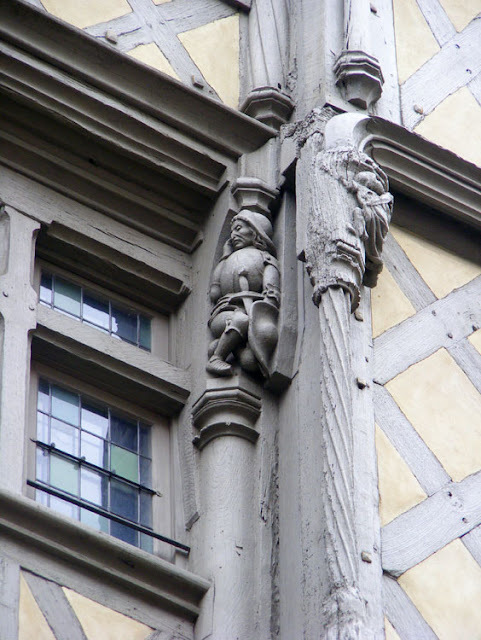 This method of cribbing a bit more space was outlawed in the 1530s. The figures are quite naturalistic, typical of this period. Also typical are the strong horizontals dividing up the facade, and the prominent cross bracing. Luckily, my sense of humour is so good that I am forgiven for everything. 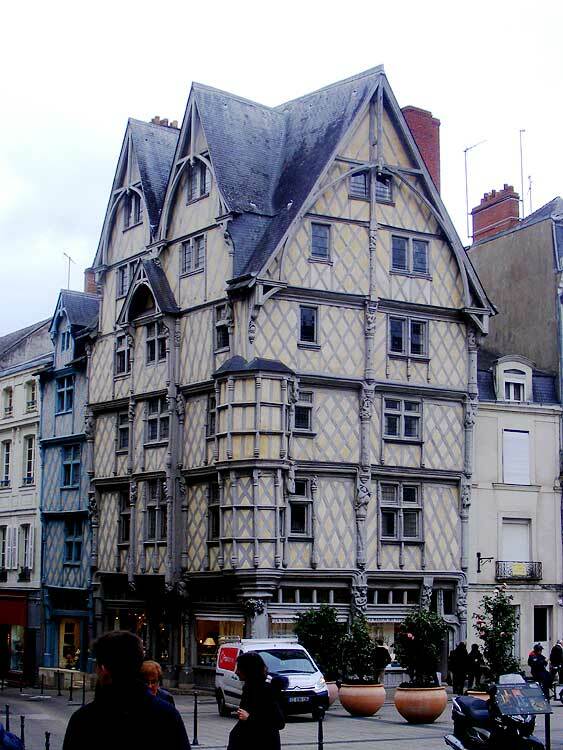 Angers has some magnificent architecture. 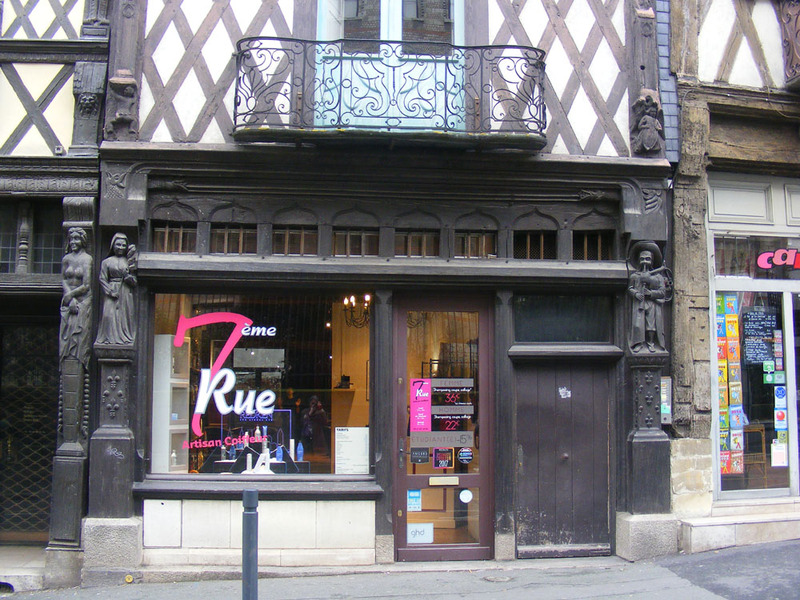 One of the most unexpected buildings is a large art nouveau structure on one of the principal shopping streets. It dates from 1902 and was built as the cafe-concert de l'Alcazar, a popular venue which had been going since 1892. 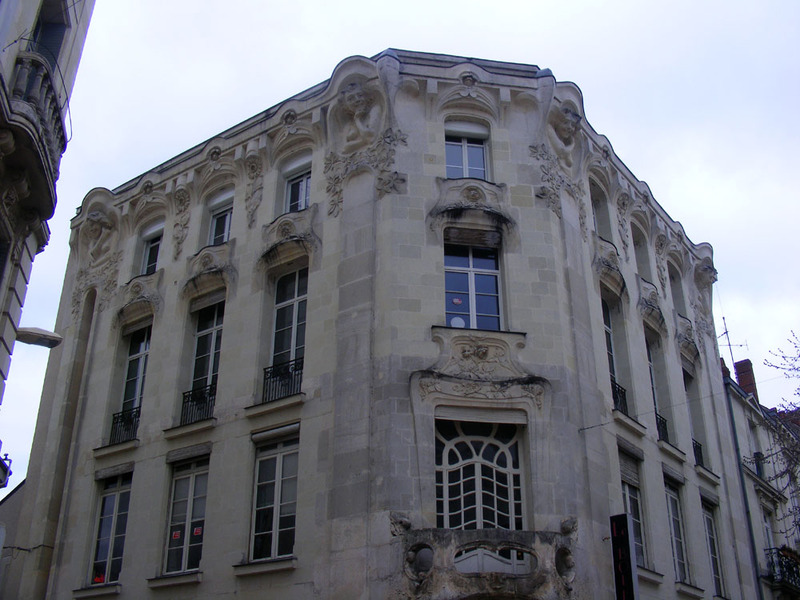 The architect was Gaston Réchin and the chief sculptor Maurice Legendre. The building was in fact a reworking of an existing house that stood on the site and was commissioned by Pierre Thiébault the regimental bootmaker to the 135th infantry and run very successfully by the Widow Bourteau, who had run the Alcazar before its art nouveau makeover. 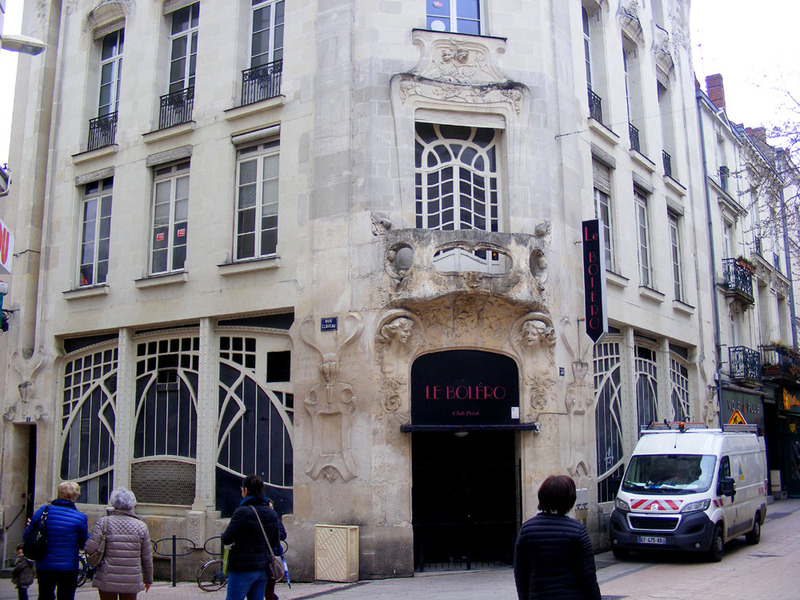 The fashion for concert cafés started in Paris in the 18th century, and venues like this offered caberet, cinema, dancing, concerts, balls, acrobatics, magicians and music hall. The Alcazar employed a house orchestra. Not many years after it opened in 1902 it changed hands and became the El Dorado. In 1933 the building was greatly altered, losing its metal bow windows either side of the corner on the first floor and guard rails were fixed to the second floor windows. Today the building is a private club called le Boléro. Six female busts smile down from on high, to give you an idea of the ambiance inside. Augmenting the pretty women are floral motifs by the carver-designer Louis André, who created sunflowers, roses and chestnut leaves to twine around the openings. The new building had electric light, with ceilings lit like never before. The public was charmed. Performers came from all over, including the Folies-Bergères in Paris and the Alhambra in London. Locally born Nini Patte-en-l'Air came to dance the cancan with her colleagues from the Moulin-Rouge. On the other hand, young singer songwriters started their careers here before moving on to find fame in Paris. The public taste in operettas seemed to be for the more melodramatic and stunt filled the better (a show called 'The Circle of Death' ran for an extended season). Berthe Bourteau retired in 1907 and Paul Loos took over, changing the name to El Dorado. But in 1913 scandal erupted when he killed his girlfriend, the dancer Capri. During the First World War the café closed, but re-opened as a cinema afterwards. 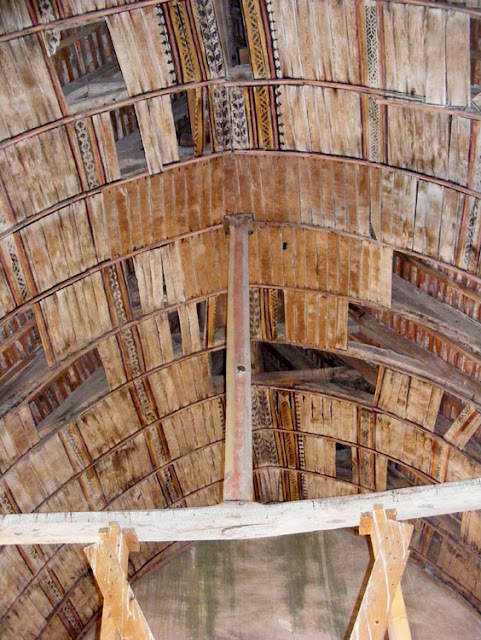 Later it became a dance hall, until the Second World War. Then it seems to have been abandoned until being revived as a private club in the 1960s. It changed hands again in 1984, but continues under the banner of le Boléro. 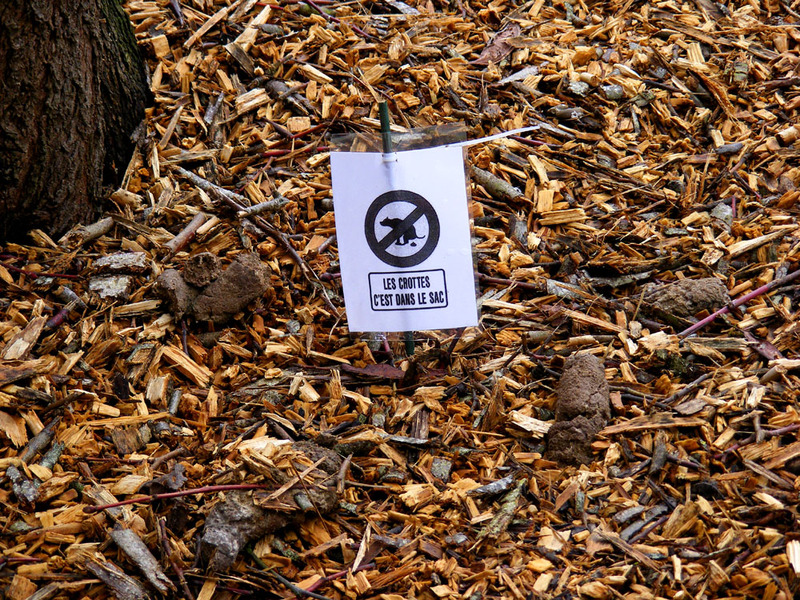 Warning: photos of dog poo. 'Thanks for the smell'. 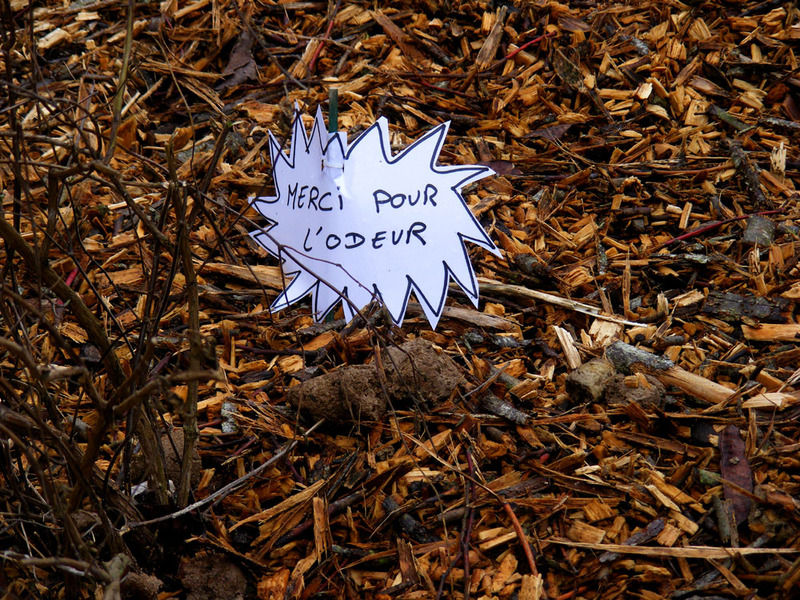 These signs have sprouted in a small public garden in Loches. They are hand-made or printed and laminated, presumably by the people who live next door to the garden and whose windows open out on to this view. In the last year or so the campaign to rid French streets of dog poo has really started to gain ground. It is being pursued in equal measure by fed up local authorities, who are regularly reminding dog owners that they can pick up a supply of plastic bags from the town hall, and fed up citizens who are posting notices on their gates (or as these people have done, in the public garden next to their house). 'Poo goes in the bag -- it's not rocket science!' That's a loose translation to give you the idea. The French is a bit of a play on words which I struggled to adequately translate. The nuance is to do with the double meaning of the phrase 'dans le sac' (in the bag), which if you are caught red-handed is 'to have your hands in the bag', and also if the result is assured it's 'in the bag', the same as it would be in English. More and more dog poo bins are being installed in public places and as a result, those who do the right thing, or don't own a dog, are becoming less and less tolerant of those who allow their dogs to excrete in the street. It will take a little time, because in the old days, the 'proper' thing to do was to manoeuvre your dog into the gutter if it needed to go. That way the poo got washed away by the street cleaners. However, as street cleaning methods change, the habits of dog owners must change. It is already making a difference, but we'll still be cautioning people to look where they put their feet for a while yet. 'Do the right thing!' and 'help yourself'. These dog poo plastic bag dispensers are beginning to appear in towns. 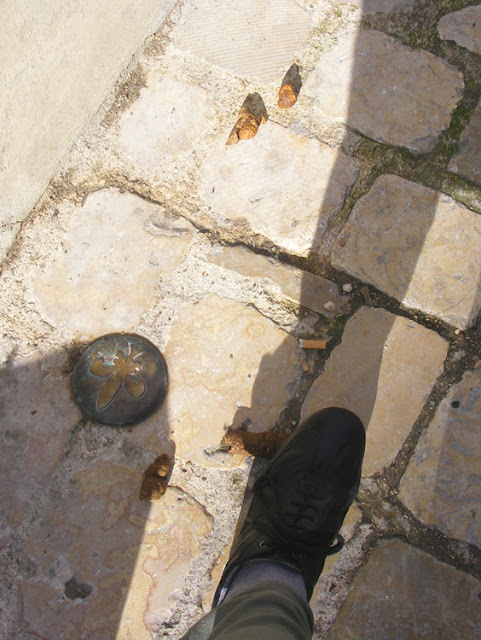 Wearing my entomologists hat I am ambivalent about the dog poo issue. After all, some of the best insects are attracted to poo, and my first sighting of the rare Purple Emperor butterfly Apatura iris (Fr. 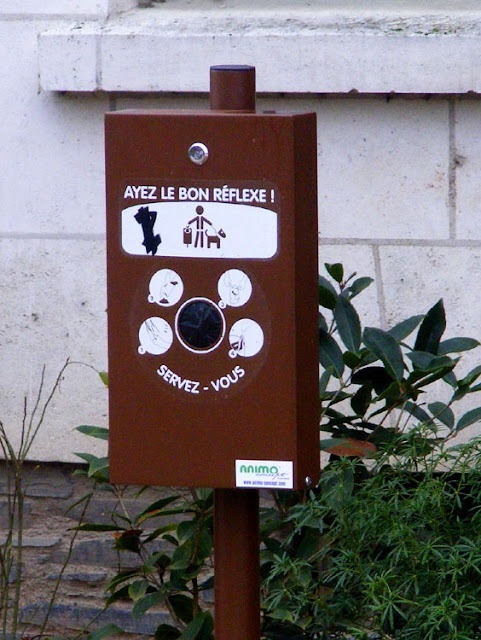 le Grand Mars changeant), for example, was on dog poo on the path in the Forest of Preuilly. Obviously in town though, it needs to be cleaned up. Supposedly, it is 'good luck' if you stand in dog poo with your left foot. What idiot dreamt up that idea? 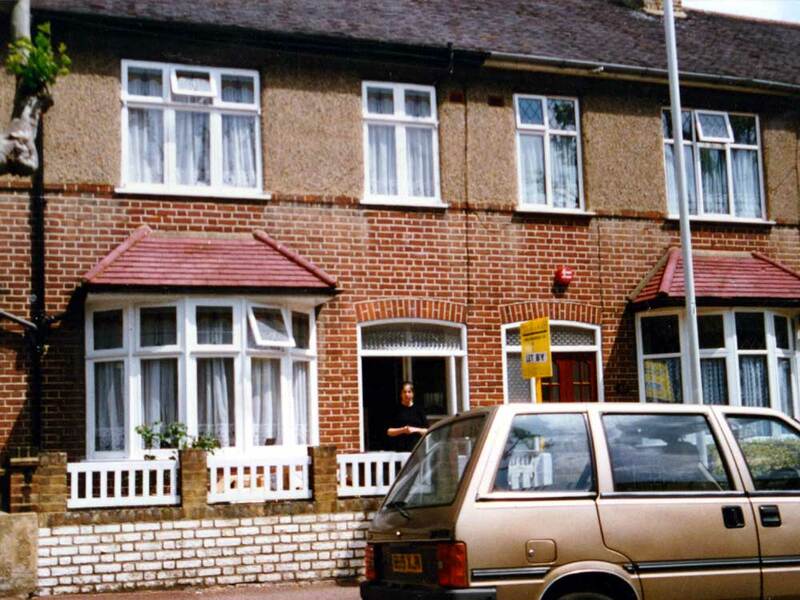 Twenty years ago Susan and I left Australia to start a new life in London. We were emboldened by a certain amount of optimism and naivity. Because it was at the absolute start of the internet era we had looked online from an internet cafe at options for housing and jobs, but it was slow - which we took to mean slow internet rather than lack of options in London in 1997. Between us we had a 4 week booking at a "holiday apartment" in south-east London, a certain amount of savings, a suitcase of clothing and two bass guitars. 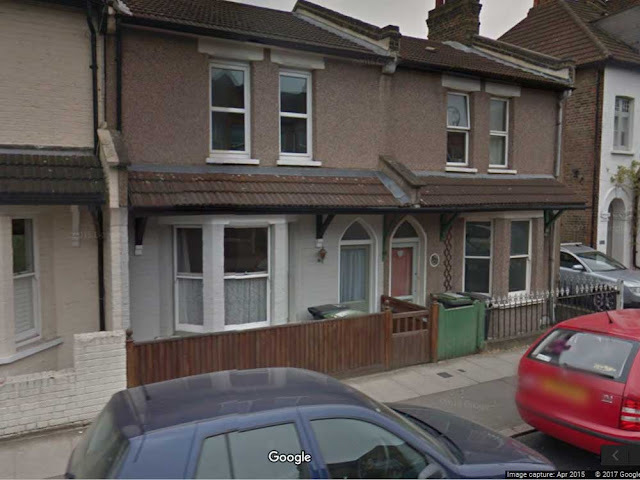 in the UK was 322 Devonshire Road, Honor Oak. Its the place with the brown fence. For a while we actually followed the path we thought we would. There were concerts, shopping for new wardrobes, Susan got exactly the job we hoped she would get, and I re-entered education. We even managed to rent a historic house. Over time we settled in to life in London, then realised that it meant we weren't doing stuff any more, that real life in all its banality had caught up. We took a couple of trips to Europe as soon as the financial situation levelled out, started going to the occasional concert again, but it no longer felt like the adventure we wanted to have. We started looking for another change - and after a while things started to take their own course, one we never thought we would be on. 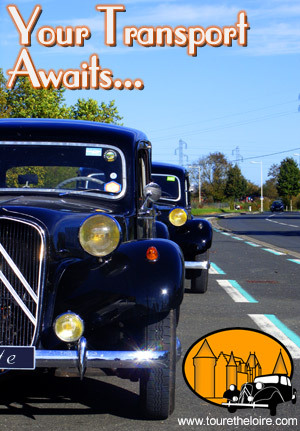 Almost 8 years living in France, owners of a part stable of classic cars, with excellent friends and neighbours. For one of us every day is an adventure as soon as he steps out of the door - words to try to recall, workarounds for grammar, remembering to say "bonjour". Susan has the potager and real soil, something we never had in London, and a growing circle of scientific type friends. Sometimes the challenges wear us down, but we are a pretty resilliant team and one of us eventually comes through. We try not think too much about what the future holds, because at the moment we are enjoying our life here and quite frankly the thought of being forced to change it is too depressing. 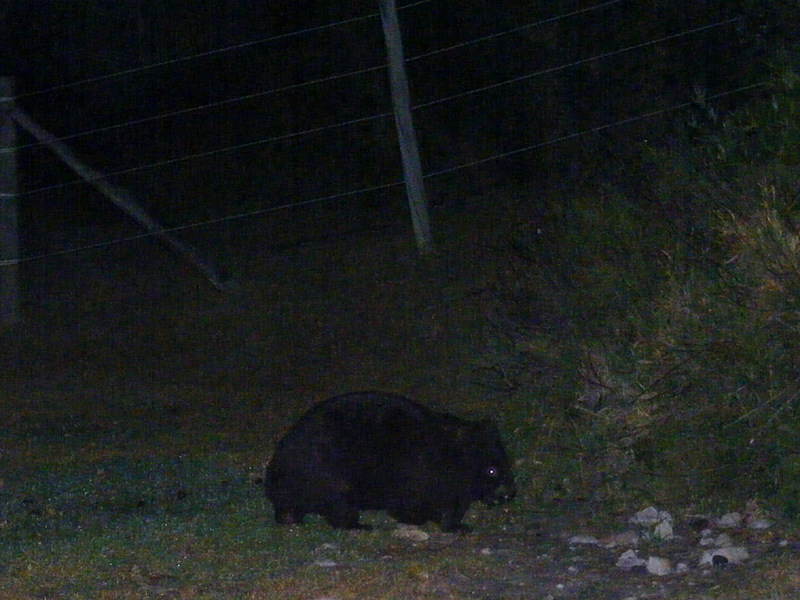 This wild wombat is resident at Green Cape Light, New South Wales. It has an extensive burrow near the National Park ranger's home and uses her carport as a latrine (which I'm sure she could probably do without). However, it does mean that I have excellent photos of wombat poo in my archive. I will forego showing you, but wombat poo is famous because it is cubic in form. Wombats are about a metre long and can weigh as much as 40kg. They live in the cooler areas of Australia, in forests, grasslands and coastal heath. Solitary and territorial they are mainly nocturnal, but can be seen out grazing in broad daylight too if the weather isn't too hot. They live about 15 years. Like most Australian native mammals they are marsupials, raising their single young in a pouch. One of my favorite cartoonists has died. Murray Ball started writing Footrot Flats in New Zealand in the mid 70's, and as anyone who has had anything to do with sheepdogs can tell - he knew dogs! 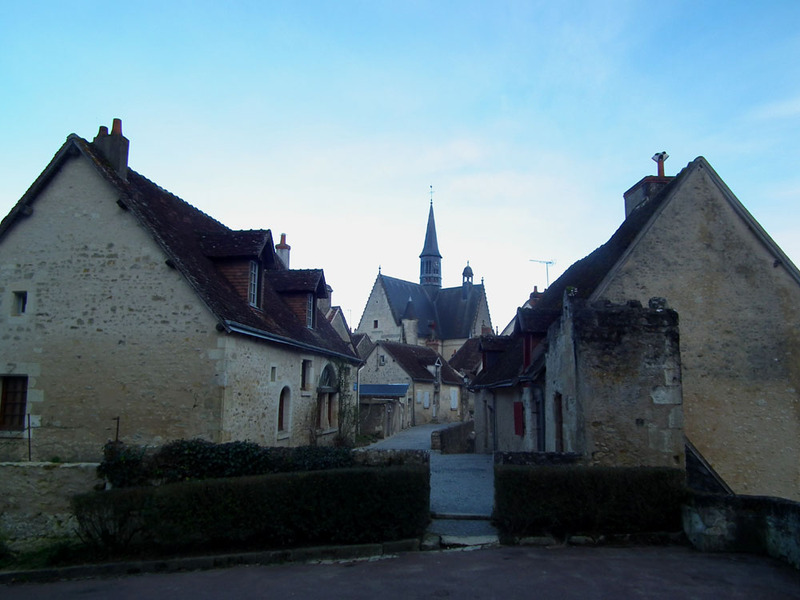 Montrésor is one of the plus beaux villages de France, and deserves its title. You can't have too many pictures of this lovely village in my opinion, so here are some more. 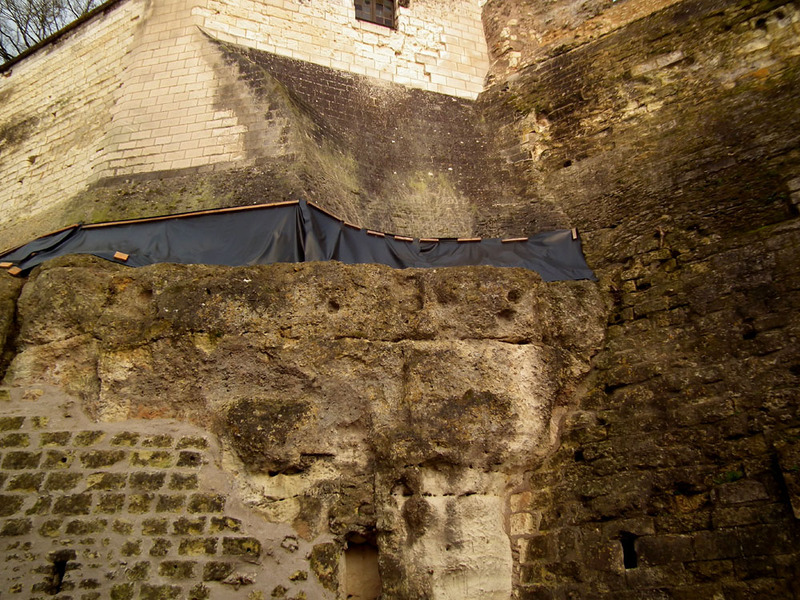 For several years now the local authorities have been concerned about the state of the ramparts of the royal citadel in Loches. For many years they have been covered in quite mature vegetation which was sending roots deep into the stone, and every freeze-thaw cycle was causing more masonry to slough off. 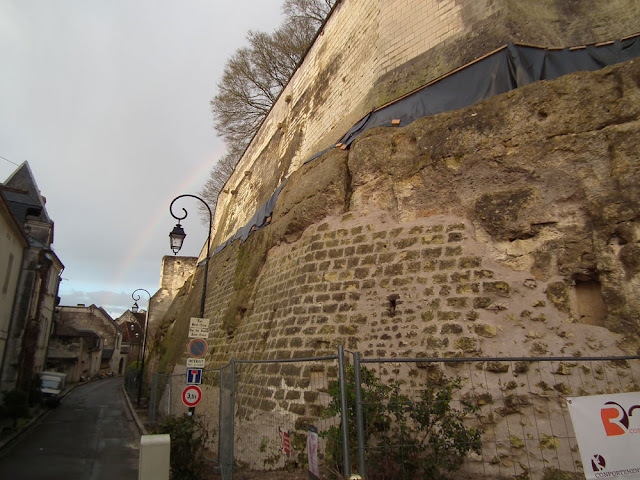 Newly vegetation free ramparts along rue Saint-Ours. Now, finally, some funding has come through and the vegetation has been stripped. The job of protecting and putting back together the damaged masonry has begun. A view of the section just under the jester window (click on the link if you want to see what the ramparts looked like before all the vegetation was removed).